Hello, my name is Helen Draper. 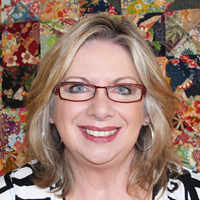 I am a quilt designer, maker and teacher based in the Southern Highlands of NSW, Australia. Although I have been obsessively sewing since the age of seven, I didn’t start designing and making quilts until the early 1990’s. 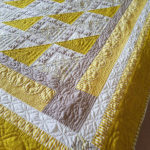 Since then, my love of quilt design has grown, and in 2006, I began Patchwork Bliss so I could share my patterns to help others find the joy of quilting. Many of my patterns have also appeared in Australian quilting magazines. Like many fabric addicts, my quilt designs always start with the fabric. Simply put, fabric inspires me and, as a colourist, I use fabric and colour to create surprise and excitement. Most of my quilts are based on traditional blocks but it’s the use of the fabric that brings them into today’s world. My guilty pleasure is to piece by hand whenever the opportunity arises. However, I nearly always quilt by hand. Although, my first love is traditional hand quilting, the current trend for using a big stitch with colourful threads is very pleasing – and so much faster! Being able to share patchwork and quilting with my patterns , blog and classes give me enormous pleasure. What’s not to love about sharing a passion, making new friends and being surrounded by fabric? and now is the perfect time to make a quilt and find your own creativity.